Can you spot the differences? We won't blame you if you can't. Before the vehicle’s official debut at the Geneva Motor Show, Alfa Romeo has unveiled its facelifed Giulietta. Since changes have been minimal, the hatchback looks extremely similar to the previsions model that came before it. The new edition features a slightly refreshed front bumper and a new grille with mesh inserts. 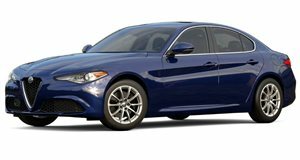 Other changes also include revised badging that mimics the Alfa Romeo Giulia, as well as new wheel patterns. From the outside, it looks like the same Giulietta from last year. On the inside, the idea of modest changes continues with refreshed trim, the latest version of FCA’s Uconnect infotainment system and upgraded upholstery. The Giulietta Veloce takes these modest steps a little further with sportier bumpers, gloss black mirror caps and revised side skirts. The interior of the sportier versionl also comes with leather and Alcantara sport seats, faux carbon fiber trim, a flat-bottomed steering wheel and red contrast stitching. The engine lineup features four gas power plants that range from 120 hp to 170 hp, along with two diesel options that run the same range. Power is sent solely to the front wheels. The high-performance Giulietta Veloce comes with the same turbocharged 1.75-liter motor from the Alfa Romeo 4C and produces 240 hp and 221 lb-ft of torque. Thanks to this punchy motor, the hatchback can get to 62 mph in six seconds and onto a top speed of 151 mph. Pricing for the Giulietta in Italy starts at roughly $24,482 and tops out at $38,492.